We look forward to seeing you at the meeting. This is our main Savannah REIA Meeting for the month, so don't miss it! Please be sure to invite your friends to join us at the meeting and to follow us on Meetup.com and Facebook.com. Also, be sure to Like Savannah REIA on Facebook where we will also be posting any upcoming meetings, events and other useful information. You can also interact with our Facebook page and post your have's and wants as well. 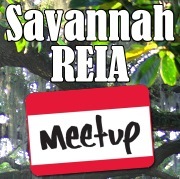 If you are interested in being a part of the Savannah Real Estate Investors Alliance, investing in real estate or just want more information on our new REIA, be sure to Join Savannah REIA's New Meetup Group so you can stay informed on any upcoming meetings and events.